A Life Without Bread by Dr Dr Christian Allan and Dr Wolfgang Lutz is a low carb high fat diet with protein, which sets out to show how a low-carbohydrate diet will help you to lose weight and can cure many diseases. Dr Allan graduated in chemistry from the California State University – East Bay and gained his doctorate from the University of the Pacific. 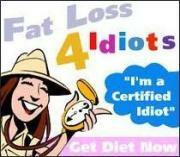 Dr Lutz is an Austrian doctor who has been researching low-carb diets for more than 40 years. The book was originally published in German in 1967, but with the help of Dr Allan, has been brought up to date and re-published in English in 2000. They argue that contrary to everything we have been told before, saturated fat is healthy. Additionally they say that ALL carbohydrates convert into sugar once consumed. It’s a myth that complex carbs are good for you, it’s simply that they are not as bad as simple carbs, as they take longer to be absorbed. Lutz and Allan have devised what they call a utilizable carbohydrate; it’s the amount of carbs that actually gets absorbed into your body, so depending on what you are eating it will have a utilizable measure, which should be restricted to 72g per day in total. You can then eat as much as you like – just the carbs are restricted. The obvious question then is if you can eat as much as you like, won’t you put on weight? Well, no, simply because you will no longer feel hungry. The book lists the choice of foods that are permitted and those that are restricted. Lutz and Allan blame carbs for most of the diseases we regularly suffer; diabetes, heart disease, obesity, cancer and more. They are all explored in the book. This book is not your typical diet book. In other words there are no phases, no cycles whereby you cut out food, then slowly introduce others, no maintenance phase etc. This diet though is so simple. It tells you food types that you can eat and what you are restricted in eating and why. So, for those of you who want to eat cheese, butter, full fat milk, cream then go ahead, as long as you restrict your carb intake. 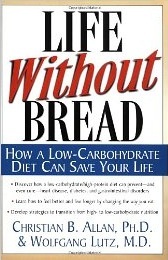 A Life Without Bread diet book can be purchased at a discounted price from amazon.